Befreiung, Eroisgeben fun "Poalei Zion" in Deutschland. Issues nos. 1-80, bound together in two volumes. Munich, 1947-1948. Yiddish. 80 issues of the journal of the Poalei Zion party for She'erit Hapletah (Holocaust survivors) in Germany, edited by the author and Zionist leader Mordechai Kroshnitz. 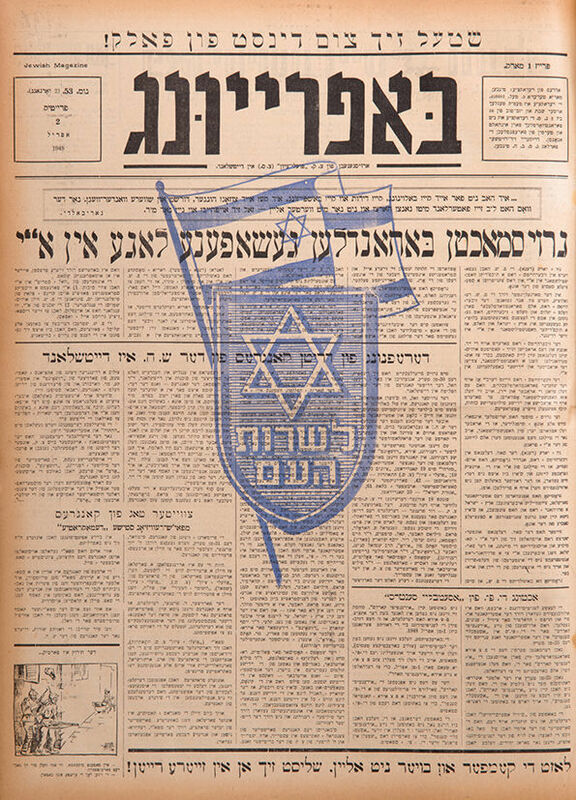 The issues include articles and news items about important current events: illegal immigrant ships, Betar and Irgun activities in displaced-persons camps, the U.N. resolution regarding the Partition Plan, battles of the War of Independence, and an issue from Iyar 5, 1948 (May 14, 1948) announcing the the establishment of the State of Israel and other topics. Numerous pictures. First volume: issues nos. 1-35, approx. 45 cm. Second volume: issues nos. 36-80, approx. 51.5 cm. Condition varies between issues. Good overall condition. Minor blemishes, mostly to margins. Slightly worn bindings, with rubbing and tears to spines and edges.